Article originally appeared in Wide Open Country. When you drive through Georgia, small towns are scattered everywhere and on any major road. Once you get out of the bustling city of Atlanta or the larger towns of Columbus, Augusta and Savannah, just about anywhere can be considered small. Here are the 13 small towns in Georgia worth taking backroads for. 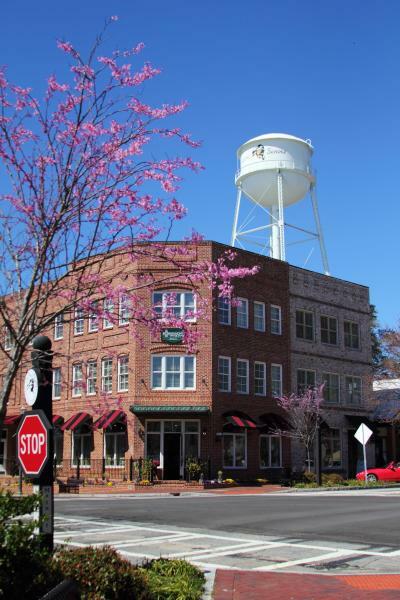 Located in Coweta County, Senoia is only a short drive from Atlanta. Several scenes from various Hollywood blockbusters including Driving Miss Daisy and the recent remake ofFootloose were filmed here, as well as some scenes from The Walking Dead. The small town has numerous bed and breakfasts, an old-time buggy museum and a picturesque townscape you expect from a small Southern town. Located north of Atlanta in Cherokee County, Ball Ground is one of metro Atlanta’s hidden gems. The small town of 1,500 is home to the Gibbs Gardens, a picture-perfect downtown and some old architecture that represents the town’s agrarian past. As Metro Atlanta expands and the population slowly starts to rise, many hope Ball Ground will be able to forever keep its Southern charm. The county seat of Morgan County is situated between Atlanta and Augusta. For most, it may be another small town, but for Georgians, it’s known as “the Town Sherman wouldn’t burn”. When General William Tecumseh Sherman made his March to the Sea, he kept the small town south of Athens in tact, due to a friendship with a pro-Union senator, Joshua Hill, who resided there. Due to the town being spared, Madison is one of the few in the region where antebellum mansions populate the downtown area, leading many to day trip. Near the South Carolina border in Stephens County, lies Toccoa. The town is known for the mountain beauty and world famous Toccoa Falls. The town of 8,500 people is known as the “Heart of Northeast Georgia” and is home to Toccoa Falls College. Located in Sumter County, Plains is not your typical South Georgia town. A few miles west of Americus, Plains is the birthplace of U.S. President Jimmy Carter. Aside from the cotton fields and peanut farms spotted throughout the small town, you’re able to see the Carter Farm, his campaign headquarters, you know, the typical sites a small Georgia town will have. With a population less than 1,000, this town will be remaining “country” for quite some time. A suburb of Athens, the Oconee County seat is known as more than a gateway to the Classic City. Watkinsville and Athens were both in the same county, until Athens wanted the county seat. Therefore, the two counties split and Athens kept the name. The quaint town of less than 3,000 has a branch of the University of North Georgia and its downtown area provides stores for shopping and museums to visit. One such museum is the Eagle Tavern, which is one of the oldest buildings in the region. It’s believed that President George Washington spent two nights there while visiting constituents in Georgia. Between Macon and Savannah on Interstate 16 lies the Laurens County seat of Dublin. While Dublin is a historical city and its namesake is for the capital of Ireland, the town still knows how to have a good time. In fact, every year since Atlanta held the Summer Olympics, the city’s neighbor, East Dublin, hosts the annual Redneck Games. Events include seed spitting, mud wrestling and belly flopping. No, seriously. You can’t make this stuff up. In Macon County (and no, Macon is not the capital) lies the quiet South Georgia town of Montezuma. Since the 1950s, Montezuma has changed from your typical Southern town to one of the largest Mennonite communities in the southeast. People often stop in the town to eat at Yoders, a restaurant run by a Mennoite family serving homemade, Mennonite cuisine. The population of the town continues to decrease and is now at approximately 3,000 people. It seems that no list involving Georgia is complete without mentioning the small White County town of Helen. Located in the Appalachian mountains, the town of less than 1,000 renovated itself into an Alpine-style village and now hosts Georgia’s largest Oktoberfest celebration. The town started modeling itself after Alpine communities in the 1960s through a zoning ordinance. Even the town’s Huddle House and Wendy’s are in the style. It has garnered enough international attention that the town of 500 even has a sister city in the Bavarian region of Germany. Another small town along the South Carolina-Georgia border is the county seat of Hart County. The town and county are named after the Revolutionary War hero Nancy Hart. The town of less than 5,000 is mainly known for the large lake of the same name that also goes through several communities in South Carolina, most notably, Anderson and Clemson. If relaxing by the lake is not your idea of a must-do, the town also has a gorgeous downtown square with plenty of restaurants and shops to patronize. Millledgeville is more than just another small town in Middle Georgia. Before moving to Atlanta, the Baldwin County seat was also Georgia’s state capital. 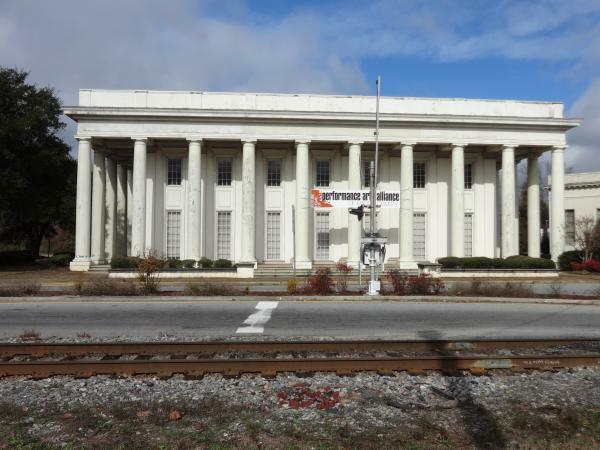 Today, Milledgeville remains the main town between its larger neighbors of Athens and Macon, but much of the past remains. 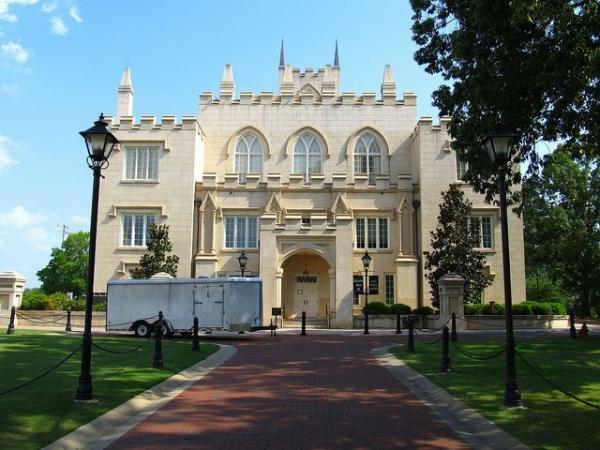 For instance, the Old Governor’s Mansion is still present and the town is home to Georgia College and State University. The town is also known to being home to Southern novelist Flannery O’Connor and is home to one of the state’s oldest cemeteries: Memory Hill Cemetery. Just west of Augusta, in Columbia County, lies the small town of Harlem. For fans of old-time cinema, the small town is known as being the birthplace of comedian Oliver Hardy, of the duo Laurel and Hardy. The town has a population of less than 3,000 people and much of its history is dedicated to Laurel and Hardy. Every year in October, the town holds the Harlem Oliver Hardy festival. Harlem is also home to the Laurel and Hardy Museum. Washington is the Wilkes County seat and is nestled along U.S. Highway 78 between Athens and Augusta. The city’s past includes being the last place where Confederate President Jefferson Davis met with his cabinet, as well as the site of an important battle in the American Revolution. Numerous legends also surround the town, including the belief that Confederate gold worth millions of dollars is buried within town limits. Washington also provides numerous shopping opportunities and Southern architecture for visitors to enjoy.